The SUTHERLAND® 2000™ Rub Tester Difference. Longevity, Durability, and Customer Service | Danilee Co. There is a reason that rub testing and the SUTHERLAND® 2000™ rub tester are synonymous, with over 60 years in the industry and setting the standard for fabric fastness and label testing it’s hard to separate the brand name from the machine itself. Here at Danilee we aren’t satisfied with just being the industry standard, we want to invent new applications for the rub tester in a variety of industries. We work to continuously improve our machine and remain synonymous with rub testing. • Longevity- When it comes to longevity there are few products on the market that can last 60 years. We have many original rub testers still in use. With proper calibration and maintenance, the skies the limit on how long they can last. If you have an older version of our rub tester get in touch with us for regular maintenance. We offer that support so we can ensure our products retain the longevity we have become known for. • Durability- Along with longevity comes durability. Our rub tester is used in various applications in vastly different environments. We want to make sure it can stand up to the test just like the products you test while using it. We recommend calibration of your machine every two years and new pads every 6 months, aside from general maintenance we know your rub tester can stand up to the wear and tear your business needs. • Customer Service- Even though we supply a tough and low maintenance product we are always here to help out with mechanical issues you may come across with your rub tester. If you require instructions, physical repairs, or just a diagnosis, our team of professionals here at Danilee are always ready to help. We love to hear from those using our product in the field and areas we could improve so we can continue to service teams like yours for the next 60 years! 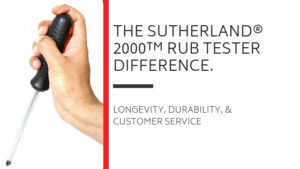 For more information on the SUTHERLAND® 2000™ rub tester check out our instructions section or our rub tester videos! Once your machine is calibrated you will receive a calibration certificate which details the fine aspects of calibration. Contact us to request a quote for calibration, parts or other services you may require.